Our coasts provide a home and livelihoods for millions of people; many of the world's biggest cities are along coastlines. Yet these precious areas face increasing threats from irresponsible development and the potential dangers of climate change. 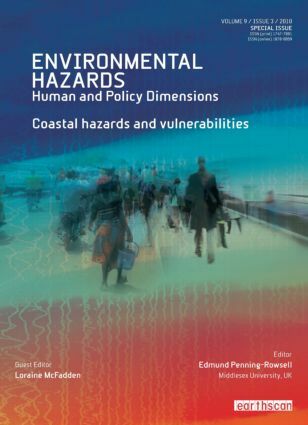 This volume explores the wide spectrum of coastal hazards, from high-magnitude, low-frequency events like tsunamis and hurricanes, to longer-term processes like urban regeneration and changing agricultural practices. International case studies range from mitigation measures in the Azores Archipelago to managing a coastal resort in South Wales, to tsunami early warning systems in the Indian Ocean Region. The resulting collection spans approaches from social science, engineering, planning, geology and biology and presents an integrated approach for assessing the impact of, and response to, coastal hazards. It will be of interest to all those involved in strategies for the environmental management of coastlines. Loraine McFadden is a Senior Research Fellow at the Flood Hazard Research Centre, Middlesex University. Her research centres on exploring challenges and opportunities for enhancing 'integrated' management within coastal environments.